The Pacer Performance 3rd Brake Light Logic Module # PP20-702 you referenced is for a single LED light. It isolates the brake signal from the turn signal on combined wires. It works in the same way as the Vehicle to Vehicle Tail Light Converter # 118158 which is confirmed to work for your incandescent light bulb function as well as LED function. 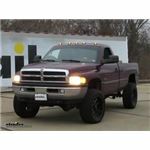 The Pacer Performance Hi-Five LED Truck Cab Lights - Dodge - 5 Piece - Amber LEDs - Smoke Lens # PP20-247S only fits 2003 to 2017 Ram models but comes with both the bulb and the LEDs. Then # PP20-246S has just the amber bulb option. My recommendation for you is the # PP20-247S which I confirmed with the manufacturer will fit your 2017 Ram 3500. The # PP20-244S only fits 1999-2002 Ram models and only has the LEDs and then # PP20-245S only has the amber bulbs. The pictures you are referring to are actually for older Silverado and Sierra pickups. I am not aware of any special wiring near the rear of your 2018 GMC Sierra 2500 but you can easily isolate the brake signal by using the 3rd Brake Light Logic Module # PP20-702. 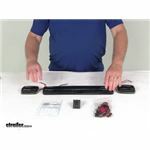 This connects to your left and right turn circuits and then gives you a separate wire for the 3rd brake light (see attached wiring diagram). 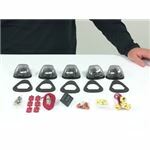 There is a simple solution to get the isolated brake signal from your combined turn signal and brake wiring. You will simply use the Pacer Performance 3rd Brake Light Logic Module # PP20-702. The module filters out the unwanted turn signal. This will work with incandescent or LED lights. 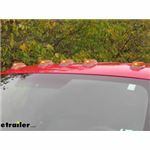 The mounting holes for Pacer Performance Hi-Five LED Truck Cab Light Kit # PP20-206 are indeed 3 inches apart on center. 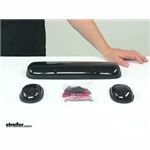 So it sounds like you will be able to use the same mounting holes! 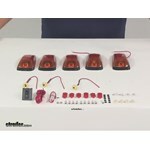 For the Pacer Performance Hi-Five Truck Cab Light Set # PP20-105 replacement lenses are not available. I called my contact at Pacer to confirm. I also checked on the similar Optronics Amber Teardrop Light Set # CB-15AK but it too does NOT have replacement lenses available. The Pacer Performance Hi-Five LED Truck Cab Lights # PP20-265 that you referenced is an exact fit for your 2008 GMC Sierra. This kit was designed to fit GM trucks that are of the generation from years 2007 to 2014 like yours so this will fit perfectly. The logic box that you are asking about is our Pacer Performance 3rd Brake Light Logic Module # PP20-702. This is a piece of equipment that is required when using an LED light as a 3rd brake light. If there is a specific light style that you are looking for just let me know and I can make some recommendations for you. The Pacer Performance Hi-Five LED Truck Cab Light kit # PP20-221 includes flexible black rubber light bases that are designed to conform and seal properly to flat or curved vehicle surfaces. This kit offers a universal fit on a wide range of trucks; they are styled to look like the factory lights on 1988-2002 Chevy/GM trucks. 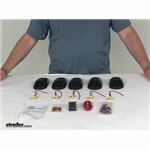 Please refer to the linked video to see more on this light kit. 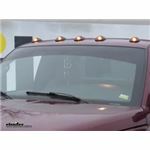 The Pacer Performance Hi-Five Truck Cab Lights - Chevy/GM - 3 Piece - Amber Bulbs - Amber Lens # PP20-240 is a universal fit that is designed to mimic the 2002-2006 factory roof lights on GMC and Chevy trucks. It will absolutely fit your 2001 Chevy Silverado 2500 HD truck. I've attached the installation details to assist. Yes, the Pacer Performance Hi-Five LED Truck Cab Lights # PP20-236 will fit your 2016 Ford F-250 Super Duty. These lights are actually a universal fit and not vehicle-specific so you won't have any problems with them working on your '16 F-250. There is nothing that says you can't use 2 LED lights with the Pacer Performance 3rd Brake Light Logic Module # PP20-702. And since LED lights draw such little power it is very unlikely that 2 LED lights would overdraw this module which is rated at 1.5 amps. I would not use an incandescent light with it though since they very well could draw more power than the module can handle. But 2 LED lights should not be an issue at all. 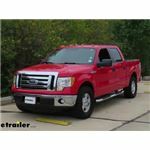 Your truck most likely already has a third brake light circuit ran underneath it for wiring to a truck bed camper. If you trace the trailer wiring back from the connector you should find an extra wire hanging free that has CHMSL on it that's for illuminating a camper shell third brake light. That said, the # PP20-702 can be used as a way to get a dedicated brake light circuit as well. To isolate the brake light signal on your 2019 Chevy Silverado 2500HD you just need the Pacer Performance 3rd Brake Light Logic Module # PP20-702. You can use the attached installation instructions for the 3rd brake light on your camper shell. Pacer Performance Hi-Five Truck Cab Lights # PP20-236 are designed for Ford trucks and will not fit your 2005 Dodge Ram 2500 but they do offer # PP20-246S, # PP20-247S, # PP20-246C, or # PP20-247. The only difference is the lens style among these 4 options.